A 12-part series about Globalization and its effect on ordinary people and communities around the world. SPECIAL OFFER: A special offer is available for six or more of any of the 'Life' Series titles. .
New! 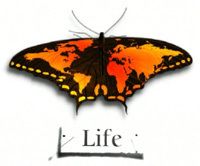 An interactive version of our printed LIFE brochures, featuring a detailed global map and clickable hyperlinks that will take you to the catalog page for each program. View or download the map here. LIFE III is a 12-part series that examines the issue of globalization and its effect on ordinary people and communities around the world. Produced for BBC Worldwide Television, the series takes us to Russia, Guatemala, Bangladesh, India, Zambia, Nepal, South Africa, and Ghana. Individual programs focus on children, health and nutrition, the HIV/AIDS epidemic, poverty, agriculture, trade, sustainable development, women's issues and human rights. NOTE: Six more series of LIFE programs are now available. 10. The Doctor's Story - The US debate over abortion has severe consequences for health care in rural Nepal. "A compelling and well-produced look at globalization's impact on humanity...this 12-part series is a must see for those wanting to solve the key issues of our time." "Dynamic and balanced...as a whole the three LIFE series are a significant contribution to the library and educational video marketplace." "For its brevity, its succinctly focusing on the important issues, and its in-depth insights, LIFE III is to be commended for helping to make classroom teaching more effective by providing the instructor a rich palette from which to choose visual and graphic examples." An 11-part series about the effects of globalization on people around the world, and the difficult choices they face as their countries struggle to meet the UN's MDGs. A new 13-part series about globalization and the UN Millennium Development Goals. A 27-part series about global efforts to achieve the UN Millennium Development Goals. 22-part series examining the effect of globalization on people and cities worldwide. How irrevocably are we shaped by the first few years of our lives? Early Life explores the arguments through the stories of young children and their families in four different continents. "A MUST for anyone involved in the social sciences. [LIFE III] explores a vast array of complex and ambiguous situations in an international context as it explores the impact of globalization on the lives of individuals and communities. The opportunities for discussion are extensive... I strongly recommend their use with anyone who is concerned about an ethical response to the problems in the world around us." "This is the best coverage of the socio-economic dimensions of globalization I've seen... ideal for classroom presentation... I would expect this series to be used extensively in Geography, Environmental Studies, Sociology, Anthropology, and Business courses."